I love Sauvignon Blanc! Yes, I know I’ve said over and over, “I’m a red wine lover, the boldest, strong tannins, the better”. Well, there are lots of white wines that I also enjoy! One varietal that is Sauvignon Blanc, New Zealand’s Sauvignon Blanc to be exact. Before diving into the wine, I had to find out why New Zealand’s Sauvignon Blanc is so unique. Early as 1870s, there was grape growing and wine making in New Zealand Marlborough region. The first exportation of wine was in 1963. The distinct citrus aromas and zesty fruit flavors of the first Sauvignon Blanc wines captured the interest of the country’s winemakers and international consumers. 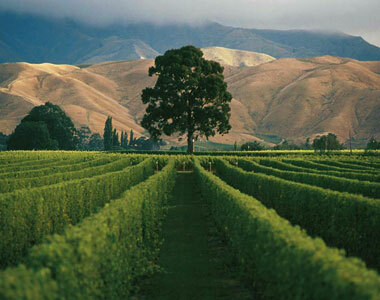 Seventy-nine percent of New Zealand’s total wine production is from the Marlborough region. The region’s sunny and cool climates and the average daily temperature of 24 degrees C (during the summer) maintains the high acid levels in the grapes and allows grapes to retain their fresh, crisp and herbaceous characteristics. The stony, sandy top soil help produce an aromatic ripe wine. 2008 Sacred Hill Sauvignon Blanc is exactly that of the traditional Marlborough Sauvignon Blanc. It has a beautiful brilliant color; bold, zesty citrus flavors of pink grapefruit and lemon. I find myself peeping at the glass, as I write, and my mouth begins to waters. “I can’t wait to taste you again”. Sniffing, eyes close, picking up oaky aromas. Finally time for another taste; tangy, citrusy, grassy flavors linger on the palate. DELICIOUS!